Microfinance has become a go-to solution to help the world’s poorest, and over time it has developed subsectors to address fields that come with their own challenges. Agriculture is one such specialty area where microfinance has tailored itself to the needs of the livelihood. Rural farmers often don’t have access to financial services because they lack credit and collateral. “Juhudi Kilimo” in Kenya is a specialty microfinance organization that serves farmers by training them for two months before they make the decision whether to take a loan and then uses the asset itself as collateral. 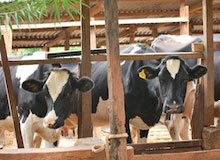 Assets range from cows to farm equipment to bio-gas plants. Arabic Knowledge@Wharton met with Juhudi Killmo’s CEO Nat Robinson, who has developed Juhudi Kilimo from the MBA Enterprise Corps after he received his MBA from Vanderbilt University in Tennessee. “Agricultural microfinancing is a bit more unique and we needed more specialization,” he says. Arabic Knowledge@Wharton: What does Juhudi Kilimo mean and how was that name chosen? Nat Robinson: Juhudi Kilimo is Swahili. “Juhudi” means “effort” and “kilimo” is “agriculture.” We first spun out of K-Rep Development Agency, which is one of the first microfinance companies here in Kenya. They had a loan product called “juhudi” and that word embodied the work we wanted to do. We added on “kilimo” to show we are focusing on agriculture and want to help farmers. Arabic Knowledge@Wharton: Why was Juhudi Kilimo spun out independently? Robinson: We spun off of K-Rep in 2009 as an independent, for-profit company and we’ve been growing independently ever since. K-Rep is still our majority shareholder at the moment. The K-Rep Development Agency is a NGO and its purpose is to highlight approaches to microfinance. It’ll use microfinance to support groups like youth, housing, and those affected by HIV/AIDs. In addition, they had an agriculture-focused product to use microfinance to better support farmers. Out of all of these different initiatives, those that are successful and worked are either sold to other microfinance institutions or banks or spun off as independent companies. The agriculture pilot was started in 2004 and proved itself in a couple of years. There was a big demand for this concept of financing productive assets like cows and chickens and irrigation equipment to help farmers generate income to service their loans. Also, assets can act as collateral to allow representatives to go into deep, rural areas where a lot of these farmers don’t have collateral and can’t access some of the traditional financial services. That worked very well and was very popular. It allowed farmers to pay off their loans. But they needed a lot of capital. Juhudi Kilimo needed about US$5 million to scale up and reach profitability and scale. It was hard to do that under the current nonprofit structure, just going after grant funding. So K-Repthought it was better to transform this company into a for-profit company. We can access social investors and commercial capital markets. So that’s why they decided to spin it off into a for-profit. The way that it’s structured, allows us to work in remote, rural areas and it didn’t really match up to some of the other microfinance institutions or banks as far as their geographic reach. And the product was very different. Agricultural microfinancing is a bit more unique and we needed more specialization. At least in the first stage, we thought it was better to spin it off as an independent. In the future, there is an opportunity for us to be purchased or folded into a bank or another microfinance institution looking to get more clients in agriculture. So that’s always an option for the future. Arabic Knowledge@Wharton: SROI stands for Social Return on Investment, which is one indicator of the impact of social investments. Juhudi Kilimo states that for every US$1 invested, a farmer makes US$15 from their investment. How does that work? Robinson: Measuring your social impact and social investment is a tough one. There’s not a good standardized method out there. We’ve been trying a number of things and working with different groups to do that. Surprisingly we have not found this true at all. None of our social investors required us to measure our social impact and none of them required us to demonstrate our impact before investing. All of the investors assumed we had a positive social impact because of the nature of our work with rural smallholder farmers. The initiatives to measure and demonstrate our social impact is purely driven internally by the management to demonstrate how we are different than mainstream microfinance. We initially started working with a grassroots business fund and they developed SROI calculations, which is looking at the number of beneficiaries supported, the incomes and other factors to measuring the investments they’re providing. Instead of looking at return on equity, we’re looking at social return on investment. That’s one way to look at it but it’s not as widely used as some of the others. We are now just starting to use the “Progress Out of Poverty Index” [a poverty measurement index from the Grameen Foundation]. When a farmer starts off with their first loan, and after their second and third loan, the Progress Out of Poverty Index measures the percentage above and below the poverty line. We can show that over time, we really are having a good impact on the lives of these farmers. That’s what I really liked about this company and this concept was a little bit different than traditional microfinance. The concept of financing assets has a much greater social impact. You can see this but it’s very difficult to measure. In traditional microfinance, clients come for a loan, use that loan for stocking their store, sell their goods and pay off the loan. When they sell it all and they come back the next year, they’re in the same position you were in the year before. Sure, you’re generating income but you’re not doing much to get out of the poverty track. If you’re financing assets, you’re building wealth. Our farmers are using the loan to buy a cow. They’re using the milk from the cow to pay off the loan. They’re then left with that cow which is then an asset to generate income and provide milk for their family. You can take another loan for another cow or zero-grazing unit or another asset to diversify a little bit. Buying another type of asset can really increase their income and diversify their sources of wealth and build their asset base. Then you can see a big transformation from where they started. That’s where we’re finding the tools that are available that will measure that — either the poverty measurement index or technology, like survey tools and agricultural tools, that will help measure all that. In fact, we were one of the first companies in the world to become GIIRS-rated [Global Impact Investing Rating System] and we are the first African company to become a certified B-Corporation. However none of this has brought in any additional capital at the moment. Arabic Knowledge@Wharton: How many farmers use your services now? Robinson: We have 16,316 farmers registered with Juhudi Kilimo. After that, 8,367 have loans. We use a group-loan methodology. We do Individual loans but we’ll work with a group of 20 people who will guarantee the loan. Those who don’t have loans will guarantee the loan for those who are taking the loans. While we have 16,316 who are working in the groups, we have 8,367 who have loans. Arabic Knowledge@Wharton: So the groups guarantee the loan as a self-help group so if one person isn’t able to the pay the loan, the others will back them up and support them? Robinson: It works like a traditional microfinance group. You’ll get a group of 20. They come in and find out about Juhudi. Our loan officers travel out to the farms. We’ll go meet with the farmers in their communities. The loan officers spend two months training them before they take a loan. They’ll train them in areas like management of a self-help group, financial literacy, financial services, etc. For a lot of these farmers, this is their first exposure to a formal financial service. Once their training is all done, out of that group of 20, there will usually be around five or six who want to take the first loan. They’ll take the loan but the rest of the group will then act as silent guarantors of those loans. If a private individual can’t pay, then it’s the responsibility of the larger group to pitch in a little bit to help pay. This is commonly used in Kenya. Our difference is all our loans are always used for assets and they’re mostly individual loans rather than bigger loans for groups. Arabic Knowledge@Wharton: I understand the goal of Juhudi Kilimo is to reach 100,000 farmers by 2015. Are you on target for that mission? Robinson: We’re looking to finish this year with around 11,000 borrowers. And then we’ll be aiming to double each year. We’ve seen other microfinance organizations and banks do this pretty easily. We believe it’s a target we can hit and the market is so big. There are so many farmers out there who don’t have access to financial loans. Arabic Knowledge@Wharton: In order to hit that growth, does that require more loan officers to go out there physically to talk to farmers, which I understand can take up to four hours to reach in some remote areas? It sounds like the method requires a lot of individual, personal attention to farmers. Robinson: Yes, absolutely. That’s probably our biggest constraint to growth at the moment. That is hiring and training our staff so we can service the number of loans. Right now, our case load for the number of loans is 250 loans to every officer. Each officer is servicing 250 individual farmers. We’re trying to get up to 300 loans to every officer without sacrificing the quality of their service. Looking at the number of loans we want to get next year, we’re looking to hire another 20 to 30 officers. We’re looking to improve our human resource capacity in our recruitment process so we can make that. Arabic Knowledge@Wharton: And these loan officers need to speak the local language of the farmers, is that correct? It’s not all Swahili, right? Robinson: A vast majority of our farmers will speak Swahili or English. As you get deeper into the rural areas, there are local dialects. It does help sometimes to have loan officers who are able to converse in the local languages. Someone who’s come from the local area has the credibility built up a lot quicker and they’re not perceived as an outsider. At the same time, we also have to be careful about hiring someone directly from the community because sometimes, there can be conflicts of interest with family and friends who apply for the loans. So we need a bit of a mix. Arabic Knowledge@Wharton: Why are 46% of the shareholder farms run by women? Is that a social phenomenon that farming is one of the most equitable professions? Robinson: That’s something that we’ve been trying to work on. If you look at the ownership of dairy cows in terms of financing assets, traditionally in Kenya, the cow is owned by the man and the land that the cows graze on is owned by the man. That’s been tough but that’s quickly changed a lot with the constitution. There are more land rights for women around ownership. It’s starting to equalize more. We prefer financing women. While the rate of repayment for women is about the same for men, there is a lot of research out there showing that the benefits they gain from microfinance, a lot of the additional income will be reinvested back into the family. There are benefits for the children to move the family forward. The good thing is one of our competitors Kenya Women Finance Trust only finances women, or predominantly finances women, so there are lots of financial services and programs available to women. Robinson: Yes, ILRI was looking at how our asset-financing model influences the livelihoods of rural female smallholder farmers. Specifically, ILRI was surveying our clients to gather data to generate a women empowerment index report that aims to increase understanding of the connections between women’s empowerment, food security, and livestock growth. The index evaluates items like the woman’s access to and decision-making power over productive resources in the household, control over use of income, and their use of time during the day among others. Sometimes microfinance can make life difficult for women because it provides them with cash or assets that can disrupt the power balance with the husband and could result in violence. We wanted to make sure our loans were actually improving the lives of women and this research will help us design better products and processes that support women. From the initial report findings, Juhudi Kilimo seemed to score very well in nearly all the areas. The report showed the women with loans were more empowered with household decisions and less likely to be subjected to domestic violence than women without loans. Arabic Knowledge@Wharton: Why is it important to have a microfinance organization devoted to agriculture? Robinson: We’re one of the few of those devoted only to agriculture. There has been a lot of microfinance in the urban communities. According to FSD Kenya [Kenya Finance Sector Deepening Program], 75% of the workforce in Kenya is involved in agriculture and about 70% of the population lives in the rural areas. Yet about 68% of the rural population does not have access to formal financial services. It’s been a lot harder to scale with agriculture but we’ve been able to overcome these challenges by financing assets. With all of our loans, we have an insurance component. So all of our cows are insured against disease and our assets are insured so that helps to minimize risk. Arabic Knowledge@Wharton: It’s been reported that 36% of all Kenyans have no access to financial services. What are the challenges for the farmers? Robinson: There’s a lot but there are three big challenges. One is access to finance to farmers. It’s a difficult thing because the banks are wary of the high costs and there’s no collateral. After that, I would say access to market. The farmers are selling whatever they’re producing on the farm. If you give a farmer a loan for a cow versus their crop, if they won’t be able sell their produce, they won’t get a good price to pay off that loan. That’s a big challenge. The third one is access to information or training. Being aware of the new farming techniques. Crop farmers can access seeds and fertilizers. At Juhudi, we believe if you can take care of these three things, we can help take care of the farmers. We can help with the first one and we work with a lot of partners to talk about access to market and we work with the Ministry of Agriculture and Livestock, especially for training. We’ve also done things like we’ll partner with a local cooling plant to cool their milk. So the farmers will be able to sell their milk to that cooling plant and then the big processor will come and collect the milk from the cooling plant. At least that rural cooling plant is a lot closer to the farmers and they can sell to the market. We’ll provide the loans to those farmers and then they’ll sell their milk to the cooling plant. Arabic Knowledge@Wharton: I was interested in the idea of manure being used into a biogas plant to generate electricity for the farms. Does that work for an individual homes or areas? Is that quite common? Robinson: Yes, we’re trying to do more of those bio-gas plants. It’s hard because they’re expensive. They’re around US$1,000. The ones we have now tend to work with a minimum of two cows. They’re for individual farms. That can literally save the household from buying cooking fuel. The challenge is convincing the farmers that it’s a worthwhile investment and finding suppliers who can come in install the plants and do service work in case they break. Right now, our biogas plants are predominantly in the central part of Kenya, not far from Nairobi. It would be great to expand that to our other branches. Most of our operations are in western Kenya. It’s a huge struggle to get a biogas supplier out there. We’re limited in finding a good provider but it’s a nice one for the farmers. Arabic Knowledge@Wharton: Potentially, bio-gas would help with reducing energy poverty. Robinson: Yes, energy is a big one. We’ve also tried getting into more solar power because a lot of our farmers are off the grid. We’re talking something like 10 to 15% of Kenyans have access to regular electricity. Most of our clients don’t have regular power. We’ve been helping to find something to provide electricity, even if it’s something like charging cell phones or providing light at night for their children to read. Distribution is really tough to do affordably. Getting the technology out there and also making sure it’s serviced as well as marketing to farmers to try something new. Arabic Knowledge@Wharton: A developer from Google, Kevin Gibbs, developed a simple MFI, open-source Android app for loan officers to see client information. How did your organization partner with a Google employee? Robinson: It was random. One of my friends said he knew a guy from Google who was taking a sabbatical, wants to come to Kenya, wants to work for three months for a company, and help develop stuff. We said, “We’ll take him.” He’s a really nice guy and we had great time with him. He developed a neat application that runs on cheap Android phones that our loan officers have, which allows them to view all our client information that connects to our accounting system. They can go to the group meetings and pull out real-time information on their payments on their phones. This allows them to manage the groups. We would love to establish more formal relationships with the big corporations like Google in the future if we could. I think there is a lot of opportunity to work with the experienced employees from large banks, consulting firms, technology companies and others. Arabic Knowledge@Wharton: I understand you started working at K-Rep through the MBA Enterprise Corps. You received your MBA from Vanderbilt University in Tennessee. Can you explain more about that program? Robinson: Yes, that’s how I ended up here. I didn’t think I would be here for four years. It was a short-term assignment in the MBA Enterprise Corps. At the time, I was working in Washington, D.C., for Accenture. And I took a leave of absence to do this thing in Kenya. It sounded fun and I was helping to develop a business plan with a social investor Grassroots Business Fund who had contracted out MBA Enterprise Corps to help this fund find investments in Kenya. One of their initial pipeline investments was to evaluate this agriculture pilot program under K-Rep. I thought it was innovative and there was a big market. This is worth it and you should invest. They invested a little bit and gave us some grant money to get us going. When they realized it required US$5 million, they said it was too much for us. We’re out and your contract is done so you’re on your own. I thought, “Well, I’m liking Kenya. The weather’s great. The people are really fun. I’m going just going to stick it out and see if I can fundraise. Four years later, I’m still here. I came to the company just before it became an individual company in 2008.